The Raine & Horne Semaphore Seaside Carols is on again this December. Come along to the Semaphore Foreshore and help sing in the Christmas season at this free community event! This free community event is held every year on the Friday when schools break up for Summer Holidays in December – that’s Friday 16th in 2016! We are super excited that Blast Off will headline this year’s event performing carols from their brand new Very Merry Christmas album! Blast Off are Adelaide’s hottest children’s entertainment group. There will be lots of carol singing for everyone to join in and Cosi from South Aussie with Cosi will be the host on the night! There will be food vans so come early grab some food and get a good spot! A huge firework display will light up the sky at approx 9:20pm! The Semaphore Summer Carnival will also open their 2016 season of fun and entertainment for the whole family on the Semaphore foreshore the same night! and your kids and head to Semaphore for a fantastic night of family fun! Father Christmas may even make an appearance! 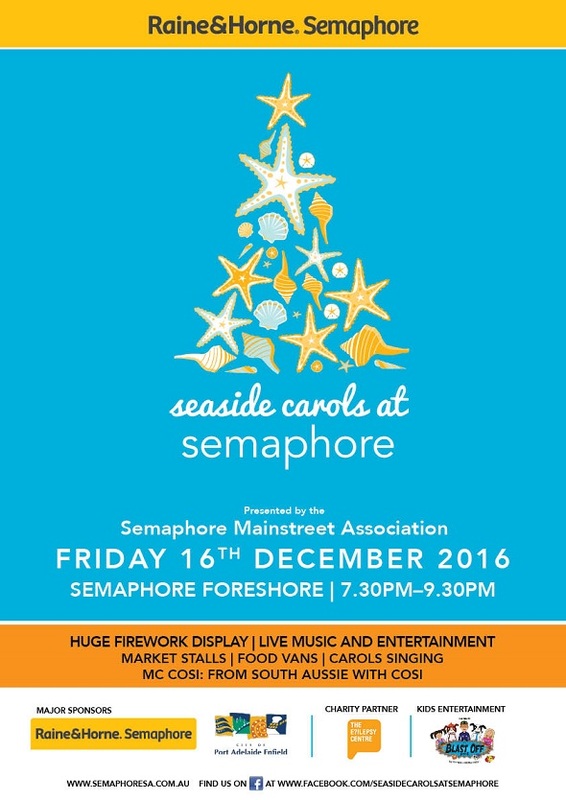 ‘Like’ Seaside Carols at Semaphore on Facebook! Many thanks to Kate Smith the Principal at Raine & Horne Semaphore for her continued support of events the Semaphore Mainstreet Association hold in Semaphore! Without Kate’s financial support events like these would not happen.